So when it looked as if the Cleveland Browns were in no hurry to hire an offensive coordinator, the tables have turned. 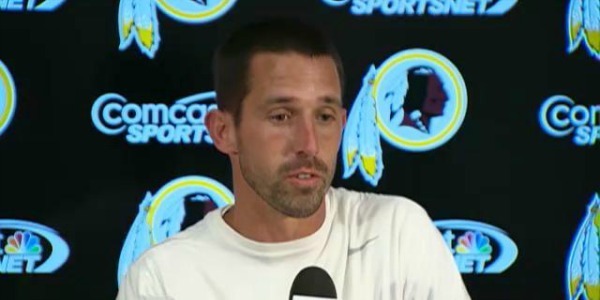 The Browns have reportedly agreed to make Kyle Shanahan the offensive coordinator of the football team. This coming after days of reports that the Browns were not caring too much for the former coordinator of the Washington Redskins. Shanahan must get to work quickly as he must find who will run this offense from a quarterback standpoint. The Browns played Brandon Weeden, Jason Cambell, and Brian Hoyer in 2013. Hoyer looked like he was getting the job done but a season ending injury took his opportunity from him. The Browns are likely to address the situation in the draft as whatever quarterback they use, will be throwing to the league’s top receiver in yards, Josh Gordon. Gordon put on quite a performance in 2013 after missing the first two games of the season to a suspension. The running game also found a little production towards the end of the season with Edwin Baker carrying the load. The Browns found the young talent on the Houston Texans practice squad. The Browns finished 27th in points per game averaging under 20 and scoring them another top ten pick in this year’s NFL Draft. Shanahan must come in and figure things out quickly. He will be working under newly hired head coach, Mike Pettine.